Newsmaker of the Week // Freddie Rahmer, Jr.
From wrecked race car to feature win. 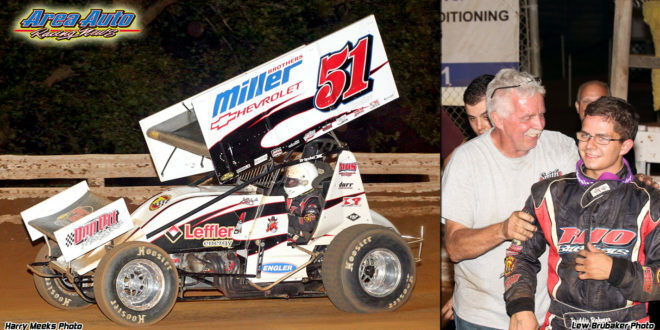 That was path traveled by second generation 410 Sprint Car driver Freddie Rahmer, Jr., who wadded up a car Tuesday night at Grandview, then, three nights later, won on one of 410 Sprint Car racing’s most legendary stages, Williams Grove Speedway. It’s hard to imagine what must have been going through young Rahmer’s mind as he was poised to win for the first time at a track his father has won on more often than any other man. And at a track where racing legends like Foyt and Hinnershitz won. Were this just another young driver, winning for the first time at any other track, it would have been nice. But Freddie Rahmer, Jr. at Williams Grove in a 410 Sprint Car holding the checkered flag is magic. Newsmaker kind of magic.